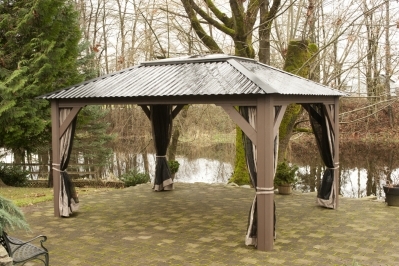 A gazebo will be the perfect addition to your outdoor entertainment, and it can even be used to house a sheltered patio set or backyard gym. 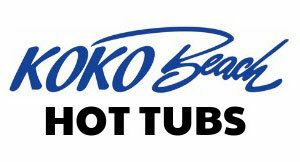 To take your backyard parties to the next level and enjoy your hot tub in any weather, contact us today! The Sienna complements your spa by giving you privacy and protection from the elements. 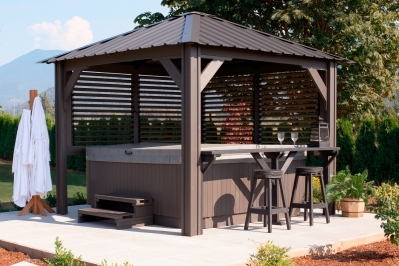 A bar with two stools makes this model the centre of attention in your backyard. Invite some friends to come and enjoy the benefits of relaxing beneath this beautiful structure. The Victoria by Visscher is one of the most popular models we offer – and for good reason. 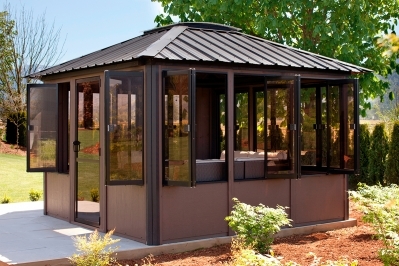 This 11x11 structure has a sturdy frame, skylight dome and screen drapes for privacy and bug control. This is a perfect addiction to your exclusive backyard entertainment. The Della structure is a welcome addition to any home’s décor. Its large 11x14 footprint allows even the largest furniture to move right in. Stargaze through the 43”x 83” skylight dome in the evenings – no matter what the weather. Choose the Vernon by Visscher and you will understand why this model provides the ultimate outdoor space to wow your family and friends. 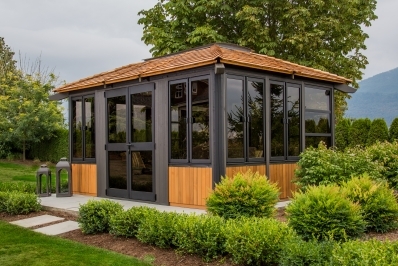 Sturdy SPF construction combined with our glass and aluminum windows makes this a substantial structure for your outdoor lifestyle. 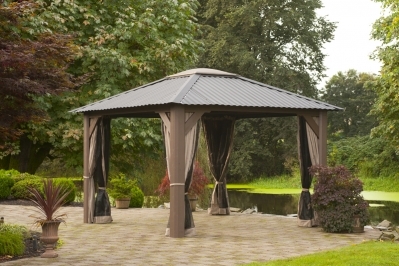 Compatible with the Visscher bay system, this gazebo allows you to maximize your living space. Click here to finance your new gazebo - easy and fast approval!